Alex and I had a great flight at Kahana a few days ago. It was my first flight there for 2016. While we were folding up, this nice looking gal was smiling as she walked up from the beach towards us. She looked familiar but I just couldn't place her. She started chatting, and we were reminded that it was Kelly, Brian Howell's better half. She mentioned that she has always enjoyed reading Wind Lines and the stories which were so entertaining. I looked at Alex and demanded, "Yeah, how come you haven't written in a long time?" He gazed blankly at me, and I snarled, "Mine are only good when you fix them." Well, Because of you Kelly, I am going to try to log some Flying Monkey Tails just for you, and any others that can stand it. This of course means that Alex will have to get out his eraser and white-out to make them legible and maybe add some of his Great Pictures. Without further prelude, here is the log from today's journey. There was a tribe of monkeys gathered at Makapuu when Ike and I arrived. 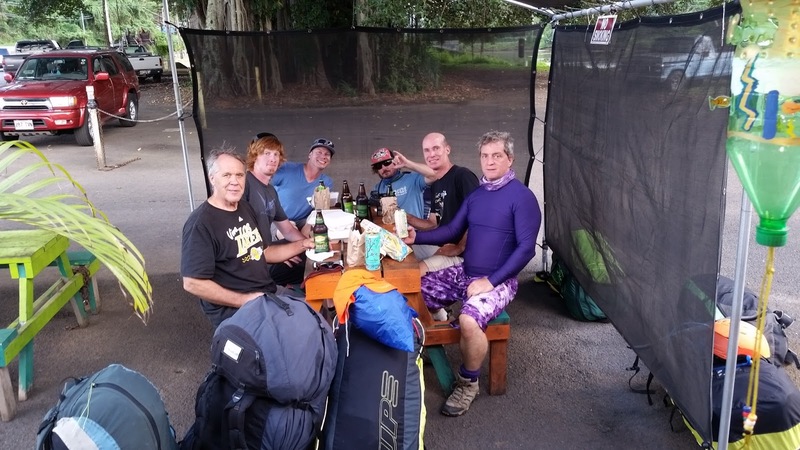 Alex, Shawn, Ryan, AK John, Tommy RD, Maui Tim and a few others had been waiting for a couple of hours for the wind to decide if it was going to remain too easterly. Finally we decided it was good enough to take a look. We loaded up my truck and headed to the lookout. HPD was parked right at the trailhead to Cactus. We knew they have been busting hikers lately, but so far we haven't had to tangle with them. "Are we shut down from hiking up there?" Alex seemed to think it was worth waiting him out, but I got antsy, put my pack on, and walked right past his car, along with Tim, John and Shawn. He didn't say a word, and after we had made a clean getaway, Alex, Ryan, Ike, Tommy followed us up. The launch was light at first, but Shawn figured it was good and took the first leap of faith. We watched him getting up, and soon after that a swarm of monkeys were airborne. The lift was light and no one was getting very high on the front ridge. A few times I was high enough to blaze back first, but instead I found myself just wasting time noodling out toward 7-11. Then I noticed that Alex was just going for it, heading to the back all by himself. I grumped at him for not giving us a heads up! But I soon followed as did many others. It was looking pretty awesome as we headed down the range. It was even better looking back, and seeing how many were in the air on a weekday. Gotta love these sick days. It was a pretty standard downrange flight with the usual ups and downs until we hit the Waiahole area. By then cloudbase was getting lower. Many pilots were not interested in dodging them any longer. The low clouds did not totally thwart me from wanting to fly back to Makapuu, but when I remembered the Thai Truck at Hygienics and got a good response over the radio, it was enough to make me agree to zero in and land, along with everyone else. We were packing up as Flash made an appearance, after having flown by himself to catch us in time for a late lunch. Six of us flew from Makapuu to Hygienics, with a few others following as far as the Pali before turning back. Unfortunately, some of us inadvertently clipped a certain cylinder on the way, and landing at Hygienics deep within that cylinder made the flights invalid for scoring in our XC League. But all were happy on the ground, all safe and sound with the usual debriefings, great food and beverages. Thanks to Vin for grabbing my truck and retrieving us, and thanks to Ike for a bunch of beverages. Thanks to Kelly for the kick in the keyboard. I will try to improve as the year goes on, both in my flying and in my writing. No points today due to nicking some bad spots, but in honor of the upcoming Super Bowl, Ike and Flash did get 3 points each. Good one, Flash!!!!! Once we got back to Makapuu, we heard that Jorge flew an amazing flatland flight, which doesn't happen on our tiny island enough. 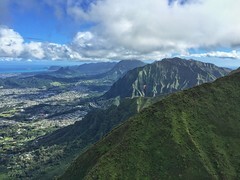 He went out to Olomana, then somewhere towards Kaneohe, and over Enchanted Lake, then circled around Lanikai, back to Olomana and on to Green Walls. He got shut down on the way back to Makapuu, when a huge rain squall snuck through, soaking Makapuu. Not sure exactly where he landed but it was not the regular LZ. Roll call best I know: Shawn, Alex, Ike, Maui Tim, Alaska John, Ryan, Flash, Sidehill, TommyRD, Vin, Garrett and Jorge. There may have been more pilots that stayed local at Makapuu - please chirp in and be counted. It's Time to Fly, Get Your Gear and Score a Goal!!!!!!! Nice story, Thom. I did indeed make a few edits. I hope I didn't take too much license with my changes! I am sincerely enjoying my extended break from writing flying stories. You've almost stopped hounding me about it now, which I certainly appreciate. Thanks to you and Dave for taking up the slack. I look forward to being on the readership side of these stories more often. And I'm always happy to edit as needed. We encourage all pilots to share flying stories if they have any inclination at all! It's super easy and you'll find that people really enjoy reading about the flights, especially if there's any mention of them! This was a super fun day. The forecast that looked so epic the day before seemed like it wasn't going to materialize. The day started super east and seemed stuck that way. But after waiting a few hours it looked more promising for sure. The sea breeze wafted somewhat onshore and the clouds lifted. Great to see so many guys charging down, two first timers and four vets, three of us pretty old salty dogs on that route. My vario died back at Ironwoods and I thought I was in big trouble considering how weak the lift was at that point. Then I remembered I have an app for that! My phone has an atmospheric sensor and my flying app will beep like a vario, even using the accelerometer to improve small scale accuracy. Anyway it was apparently good enough! And I got a decent track log out of it to boot. I've also been suffering a severe handicap the last few flights: using full speed bar has been inducing a collapse on one side, every time. I thought maybe I had a trim problem from putting so many hours on this spaceship! I had asked Jorge to check with his test pilot friends about it. But then we noticed a small compression knot in my lines just before launch, and we carefully cleared it out. I didn't think much of it at the time, and I still carefully avoided any use of full speed bar during the flight, even in the few transitions where I thought it would have come in super handy, rounding the corners downwind some of the big fat protruding ridges, and over some of the gaps between ridges where I felt a bit pinned. Then just before landing I thought to test out the problem one last time, and to my surprise it was totally fixed. The compression knot had been causing it. Whew! What a relief. I'm ready to charge now, full speed ahead, damn the torpedoes! Thanks for the coffee read Thom! I remember watching that day unfold and wondering what folks could make of it. I was surprised there was so little chatter. Thanks for filling in the blanks in my head; now if I could fill in the blanks in my flying time. Aloha!! Thanks for the honorable mention! So fun running into you guys the other day. Great story...glad you are back at it Thom. Hawaii has such a wonderful club. Keep up the good work!